RSC 2018 is a Flimsy! Good evening from South Texas where we have not seen the sun since Sunday!! We are now in a rainy spell, or just overcast skies! This type of weather does not bother me, especially if it stays in the 50’s and 60’s during the day! So much better than the 100’s. Life is good! The first part of the week I was wearing sweats. Today I wore my shorts and walked in the rain! 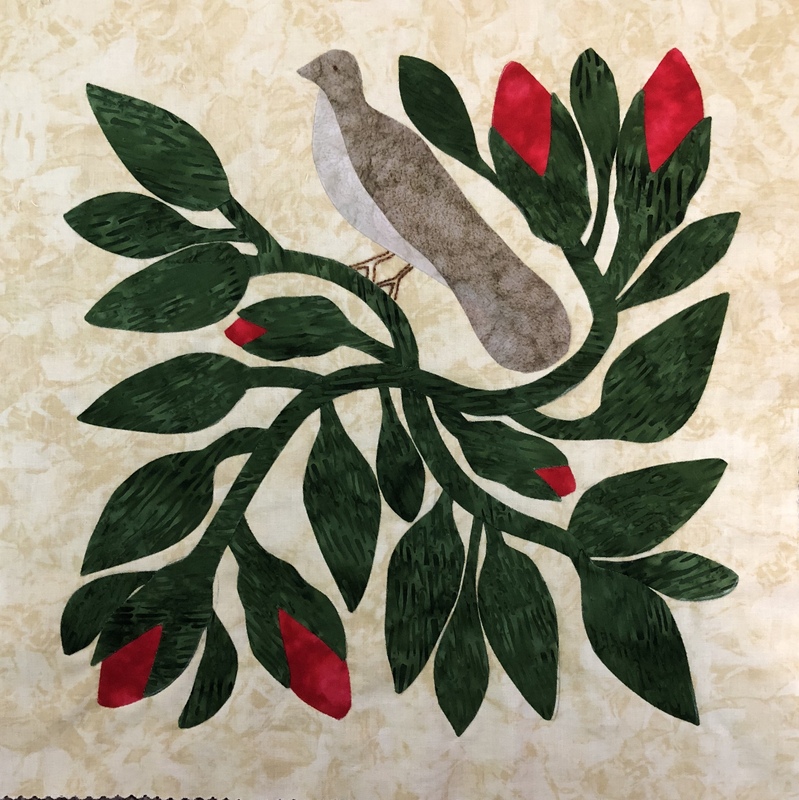 Today I have completed RSC 2018 Sampler quilt! I would like to also thank Mari for providing block suggestions each month – that was a lot of work on her part! I must say that I really enjoyed making this quilt making 3 blocks a month and catching up last week with August, September and October. Gretchen suggested to me to set the blocks on point and I am so glad I took her advice. 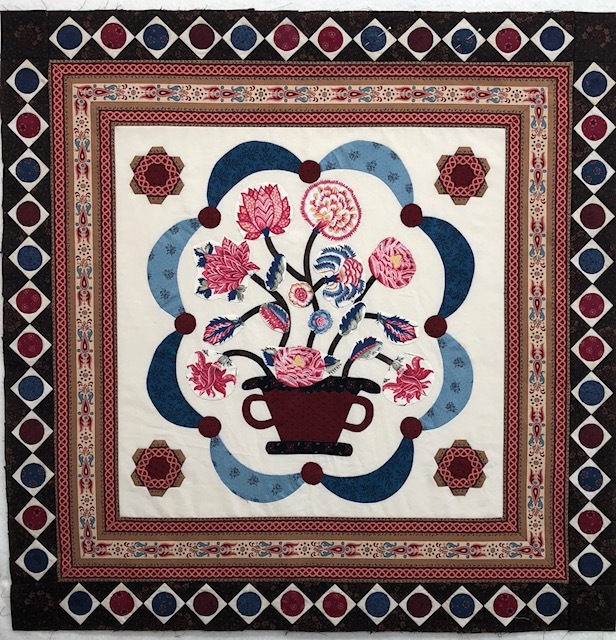 It really made this quilt pop! 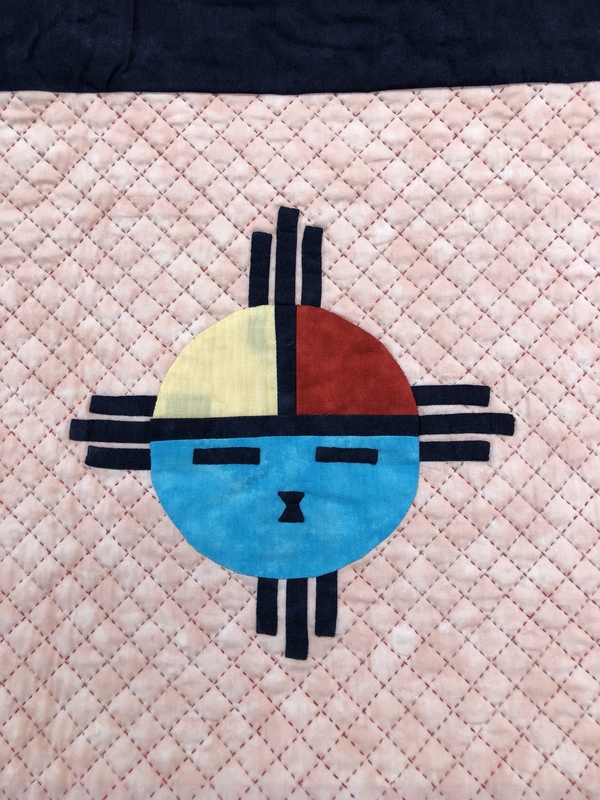 I love the white background fabric I used in making the blocks and thought about using the dark blue/violet 1” border with a white border, but I am not a favorite of a lot of white in my quilts. So I used the light complementary blue! I am a happy Quilter! Next, I finished Block 7 of A Bountiful Life! I am on a Roll. This week 2 flimsy’s and one more BL block – I am closer to my goal of finishing prior UFO’s from the last couple of years! I can now start on Block 8 tonight or tomorrow night! 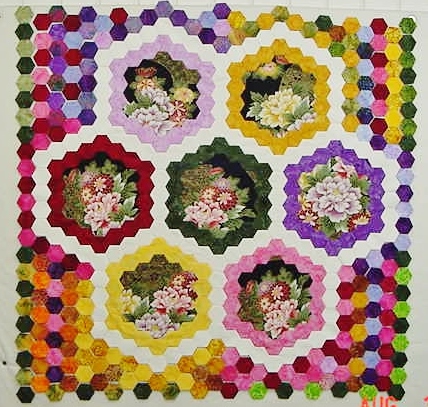 For my day projects now I am going to finish making the 1/2” hexagon flowers for the border on Mountmellick and then the remainder of the quilt will be pieced blocks! I also want to work on sewing the corner hexagons on the Center Medallion for Brinton Hall. 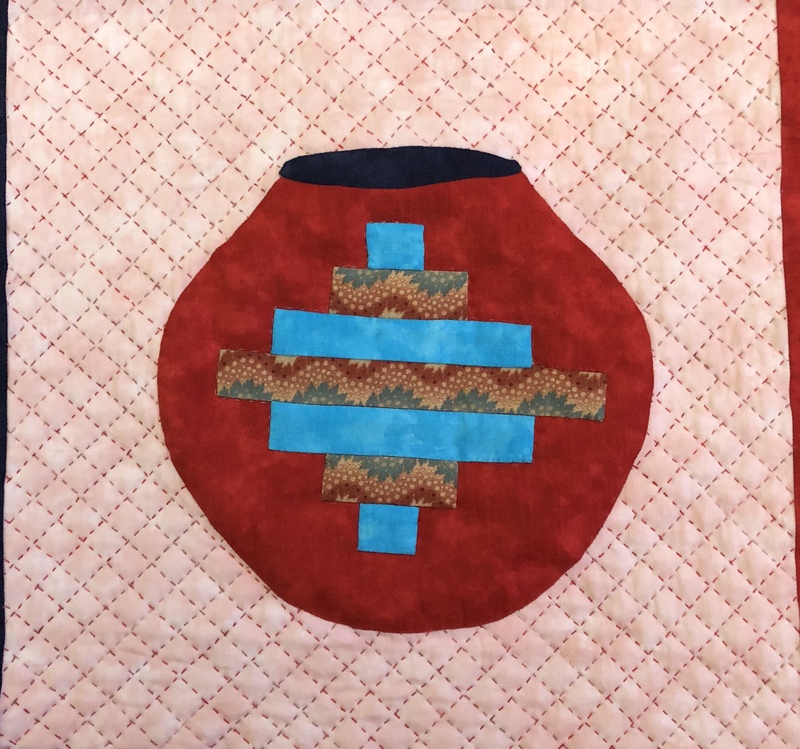 Once that is complete I will applique it to a background fabric and I believe I may have to make some more hexagons to complete the Medallion. 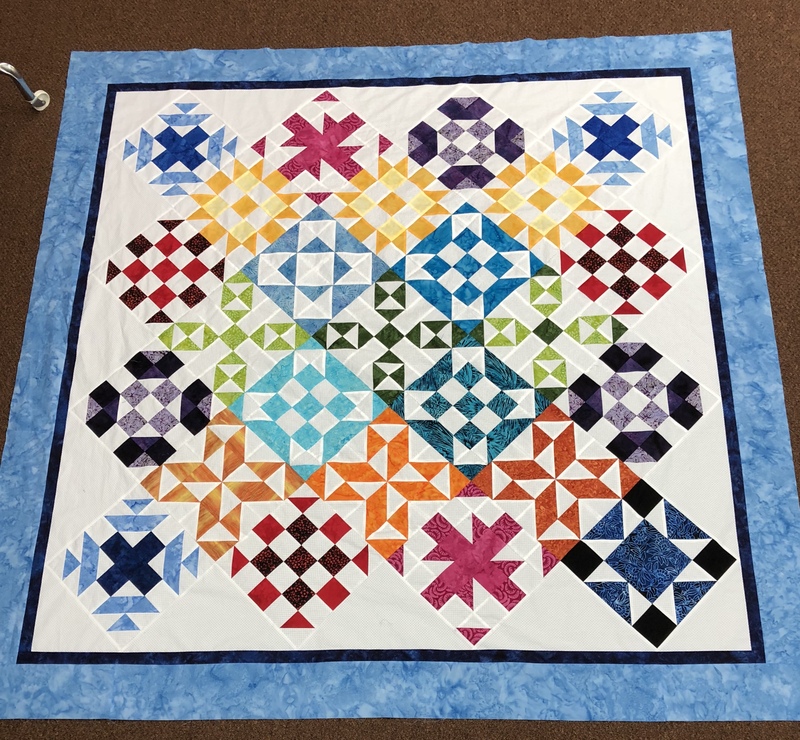 But the bottom line is that I will be doing hand work on both of the quilts concurrently in order to get to the point where I will be piecing blocks! I am hoping to finish them by the end of the year or sooner! The next border has a vine and hexagon flowers with leaves! I just need to finish the flowers. I am also behind in quilting some of my quilts, so in between I will try to load a quilt and attempt to quilt all my finished flimsy’s. I counted 4 tops that will be hand quilted and about 10 that need to be quilted on a long arm. I have 3 that will be custom quilted and entered in local Quilt Shows. Click here to see the status of my OMG for March OMG for March 2018. I have completed three additional projects that were not on the original list even though I only completed half of my original goals. 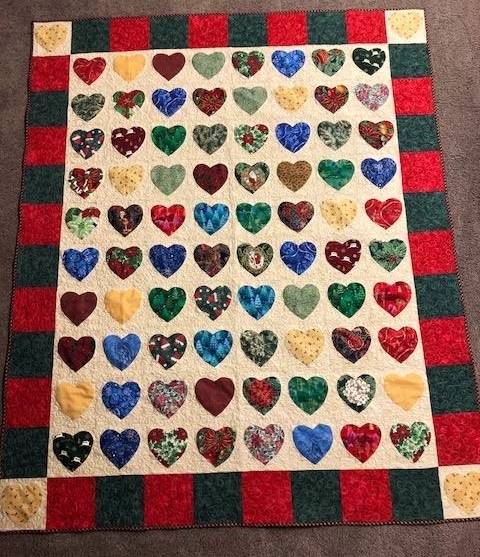 I completed the binding on Christmas Hearts and quilted my Bear Paw Quilt which tends to have a floating/optical illusion look, and completed another hand quilted block for Indian Summer Maybe this makes up for not finishing the original goal. 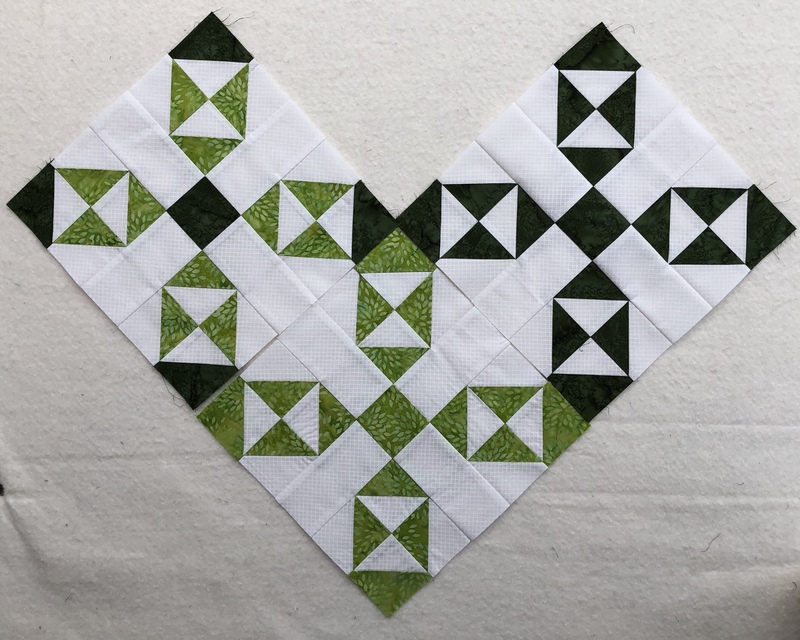 My RSC 2018 Sampler Squared Away green blocks are complete! 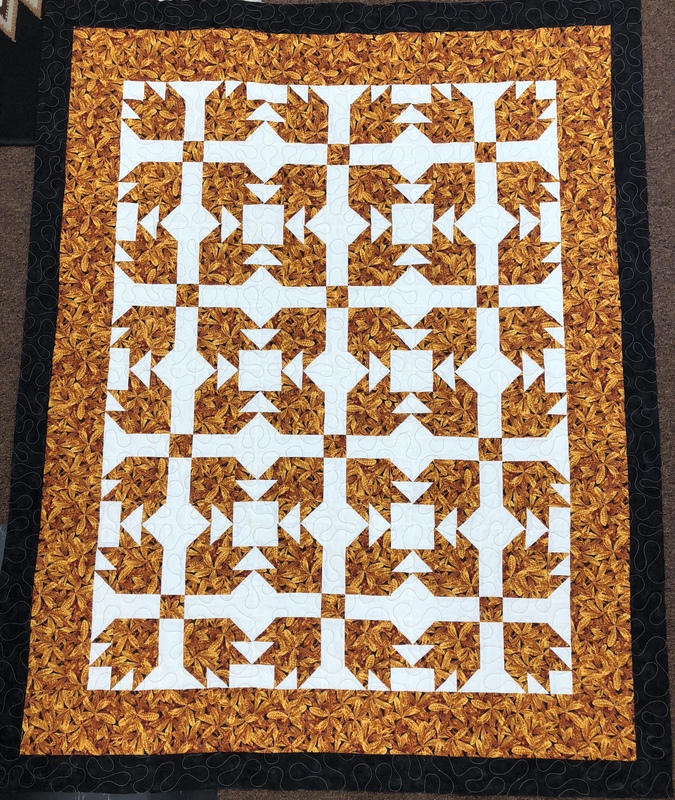 And now I have completed 2 blocks of my Indian Summer quilt! This was also an “add on” to my March Goals. I am so happy to see March 2018 over with! It was not that good of a month and it appears that a lot of my friends did not have a good one either! Let’s bring in April with nothing but fun, happiness, and more quilting!!! !